“In the ’90s, was there a quota on how many colors you had to wear at once?” This good-natured ribbing epitomizes The Great Indoors, a cute sitcom airing on CBS this fall. The show hits on many current topics such as multi-generational co-workers, budget cuts and the cyber frontier, but focuses on Jack (Joel McHale), a well-known outdoor and adventure writer in his mid-40s who has been reassigned to oversee a group of millennials who work for Outdoor Limits, an adventure magazine transitioning to a web-only publication. The frustration for Jack comes – not only from the generational differences – but from being pulled off a job he loved and then being forced to manage a group of people who don’t share his passion for the great outdoors. He says they know everything about social media and the cyber world, but nothing about what happens outside their four walls in the real world. Another subtheme is Jack’s relationship with Clark (Christopher Mintz-Plasse of “Superbad” fame), a smart, but awkward kid who worships the writer/adventurer Jack, but whom Jack finds annoying. Clark means well and as the show progresses, there are glimpses of Jack’s tolerance (maybe even affection) for Clark. One of the funniest episodes is “No Bad Ideas,” where Jack gives Clark a brutally honest performance review while Clark records it with his go-pro. Brooke (Susanna Fielding), the boss’s daughter and Jack’s old girlfriend, is the responsible and put-together middle manager who wants to please her papa while learning from her younger co-workers. The working relationship makes it kind of odd for Jack, but Brooke is determined to be professional and rise above their history. She’s often put in a difficult spot because of all these relationships she’s trying to balance, but it’s enjoyable watching her handle it with grace, humor and grit. The show doesn’t take itself too seriously, realizing it’s there to find the fun in generational gaps all of us can relate to in our lives. If anything, it encourages viewers to take the same approach in their own relationships and not get too stressed about these inevitable differences by looking for the gifts in other people, even those who annoy us. Contrast is always a strong humor technique, but it’s often a great teaching tool when it reflects real life. One final note; many will want to compare this to McHale’s role in “Community,” where he also was in a (self-appointed) leadership role with a bunch of youngsters. So far, the personalities are not nearly as entertaining or diverse as those in “Community” (except for Clark, The Great Indoors young’uns are feeling eerily similar to each other), but the show is young and there’s not been much time to develop a lot of individual arcs. “Community” was quirky and at times, just plain odd, and McHale’s “Jeff” was a pretty complex and manipulative character. 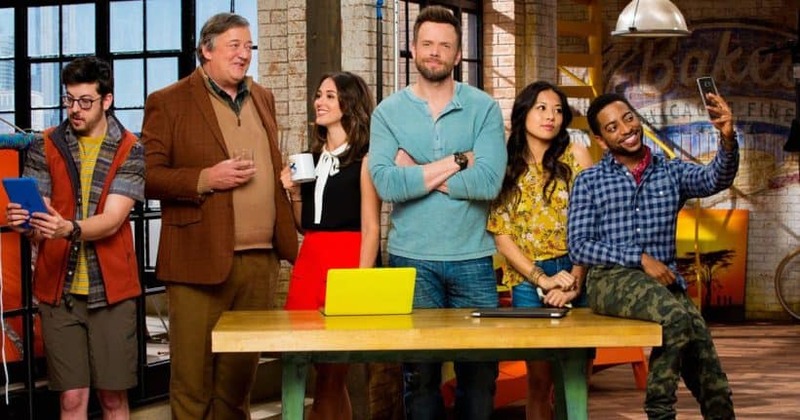 The Great Indoors isn’t showing those signs, although in episode “No Bad Ideas,” when Jack hits on the woman in his meeting with HR, I felt like we were venturing into slimy “Jeff from Community” territory. The show’s concept is clever, and the contrast between Jack’s generation and the 20-somethings are sure to provide lots of laughs, but I do wonder how long it will be before that theme wears out its welcome. There are glimmers of Jack warming to his young team as he learns from them, but viewers will want to see him develop some kind of relationship with them, and his aversion to all things digital will soon grow weary. Are we really to believe that in all his traipsing around the world, he never learned how to take advantage of the World Wide Web? In fact, that’s probably the thing that is most unbelievable about this show as the nature of his work required him to research, write and post stories on the go. But if you can forget about that reality and just go along for the ride, you might enjoy this window into today’s workplace.